Search Locations: Serving all Nassau and western Suffolk County including Great Neck, Kings Point, Manhasset, Lake Success, North Hills, Roslyn, Old Westbury, Glen Head, Sea Cliff, Glen Cove, Garden City, Old Bethpage, Locust Valley, Matinecock, Upper Brookville, Brookville, Muttontown, Oyster Bay, Jericho, Syosset, Oyster Bay Cove, Cove Neck, Woodbury, Cold Spring Harbor, Huntington, Lloyd Harbor, Northport, Long Beach, Tobay beach and surrounding areas. I have been Metal Detecting, as a hobby for over 18 years, now I have no time restraints. Over time I have found thousands of coins, many rings, jewelry, keys, cell phones and personal artifacts. Basically saving them from the ravages of time or water. 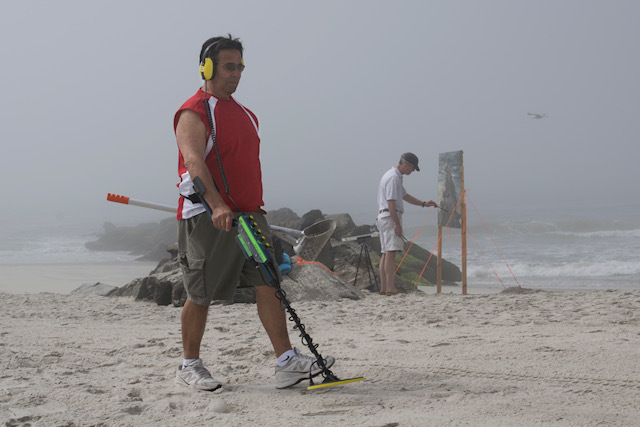 The metal detector I use is state of the art and can usually find anything that's metallic especially small items. If you lost something of value and know it's general location I can usually find it, in a reasonable period of time. Insurance Companies, Law Enforcement and Government Agency's are welcomed. Please contact me for your lost recovery needs! Lost Wedding Band recovered in the sand. A crowd of friends couldn’t find it where a good metal detector would. The afternoon turned out to be very good for this happy beachgoer!